"One of the unique qualities of Lou's work is that he incorporates a great deal of the whole jazz tradition in his playing. He's listened to just about everyone, and not only alto players. With this knowledge of the entire jazz language, Lou is definitely an individual voice." Lou Donaldson, alto saxophonist and singer. He began studying clarinet at the age of 15 and he continued to receive tuition when he joined the navy. After taking up the alto saxophone he performed in a navy band with Willie Smith, Clark Terry, and Ernie Wilkins. He first recorded with Milt Jackson and Thelonious Monk (both 1952) and as the leader of several small groups; among his sidemen were Blue Mitchell, Horace Silver, and Art Blakey (all 1952), and Clifford Brown and Philly Joe Jones (1953). In 1954 he and Brown joined Blakey's Jazz Messengers. He continued to lead small groups, mainly in the eastern USA; he performed in Stockholm (1965) and toured and recorded in Europe (1981-82). His early work for Blue Note (1952-1962) showed his impressive mastery of the bop style, "Groovin High" from 1957 [mp3], but when in 1963 he began to record for Argo (later renamed Cadet), which specialized in funk, some of his creative spark seemed to be sacrificed to the need for commercial success. After he returned to Blue Note (1967), however, he made a series of recordings (to 1975) in which he achieved a successful blend of elements of the two styles; in the early 1980s he once again concentrated on bop. Donaldson has a dazzling technique and at his best is a strong, inventive, expressive player. 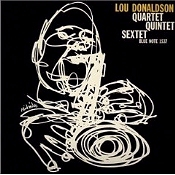 A selected discography of Lou Donaldson albums. Lou Takes Off, 1957, Blue Note. Blues Walk, 1958, Blue Note. L.D. Plus 3, 1959, Blue Note. Sunny Side Up, 1960, Blue Note. Here 'Tis, 1961, Blue Note. Alligator Boogaloo, 1967, Blue Note.